A couple of weeks ago, all I was craving was Chinese food (and I’m not even pregnant). And I didn’t want to make it myself- I wanted real take-out Chinese food (well, American Chinese food) in the cute take-out boxes, so I sent my husband to the local Chinese place and he game home with a HUGE box full of all kinds of entrees, egg rolls, wontons, and lo mein. It was incredibly delicious, but I felt pretty full from all the deep-fried food. My husband and I were talking about how we could make Chinese food a little lighter; all the flavor without all the fat. We marinated the chicken in sweet and sour sauce (my favorite!) and the end result was incredible! This meal was definitely a home run. 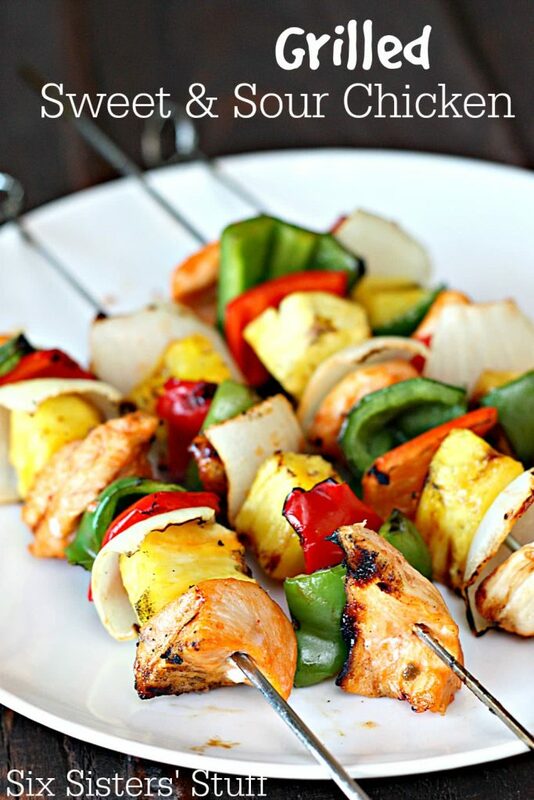 Tender and flavorful chicken with peppers, onions, and pineapple all grilled together. Cut chicken into bite-size pieces in a large resealable bag. Pour 3/4 of the sauce on top of the chicken and close bag (save the rest of the sauce for basting while grilling). 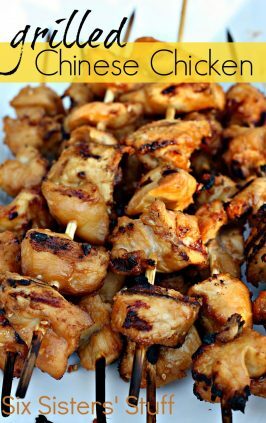 Put chicken in the fridge and let marinate for at least 3 hours (up to 24 hours- the longer you let it marinate, the more flavorful the chicken will be). After chicken is finished marinating, thread chicken, peppers, pineapple, and onion onto skewers. 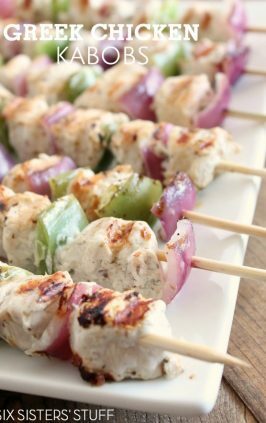 If using wooden skewers, make sure to soak them in water for at least 30 minutes to prevent them from burning while grilling. Once all the chicken and peppers are threaded on skewers, discard bag with marinade. 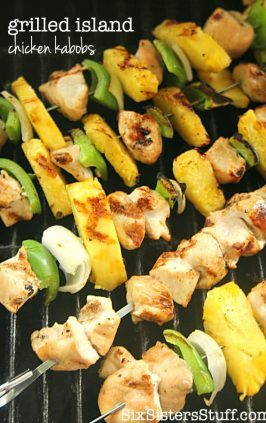 Place skewers on grill over medium heat and cook until chicken is completely cooked through and vegetables are tender, turning a couple times to make sure each side is cooked. Baste as needed with remaining sweet and sour sauce that you set aside. 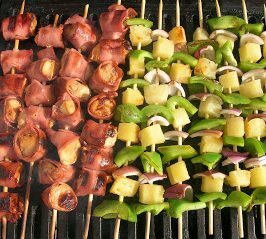 I have a thing for kabobs. It's an easy, almost all in one meal. And so many options. I haven't tried this one before but you can bet I will be soon!! We use all kinds of sweet and sour sauce that you can purchase at the grocery store. Mr Yoshidas and Kikkoman are both good. Any brand will work fine. great recipe however, plan ahead for extra time to prep and clean up. 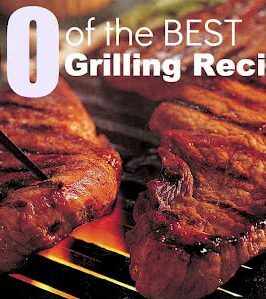 Tastes delicious especially the pineapple on the grill! 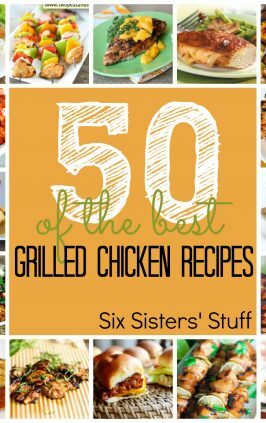 Mix mild salsa and a can of cranberry sauce and cook chicken with that! simple and delicious!